Security and Investigations company Hold Security has discovered a Russian crime ring’s hacking efforts, penetrating websites big and small in search of the lucrative digital commodity of user credentials. From a mass of cyber attacks, the group has acquired over 4.5 billion records. Within these, 1.2 billion are genuine, unique login credentials. This was accomplished by successfully attacking over 420,000 websites and is suspected to be by method of SQL injection. SQL injection occurs whereby someone inputs malicious code inside a SQL database. This can be via a standard web form or by taking advantage of a custom URL, which passes data back to the server. Once inside the database, the code can execute its custom command eg. taking lists of usernames and passwords and sending them to the desired location. There are several measures you can put in place to combat SQL injection and save your own data from criminal attack. 1.When requesting data in forms that will be sent to your database make sure you assign length restrictions. 2.Check data type and check custom text for uses of execute code commands. 3.In addition, monitor your databases to check only the correct type of information is being collected is equally important. With another huge credentials breach it highlights the urgency for regular password changes as part of good governance policies to keep your data secure. In the same week that the world heard the sad news of brilliant US comedian Robin Williams’ suicide (disclosed as a Parkinson’s sufferer by his widow after his death), another Hollywood star and Parkinson’s sufferer, Michael J Fox has publicised an olive branch of hope for Parkinson sufferers. His foundation, The Michael J Fox Foundation (MJFF) announced its support and co-funding for a study and new wearable healthcare technology app to help doctors study the effect of different medications for sufferers of the disease in the future. In a joint venture with Intel division Basis (spurred into action by senior advisor, former chief executive – and Parkinson sufferer Andy Grove), patients were provided with smartwatches armed with sensors to track sufferers in realtime. The disease is believed to be caused by a mix of genetic and environmental factors, though its exact cause is still unknown. Symptoms can include tremors, uncontrollable movements, impaired balance and co-ordination, stiffness, slowness of movement, loss of smell, decline in intellectual functioning, speech and swallowing problems. In the tests, 16 patients and nine control volunteers wore watches which allowed more than 300 data points to be recorded ever second, translating to one gigabyte of data, per patient, per day over a four day period. The information gathered was then uploaded to Intel’s system by a smartphone carried by the wearers. The data seeks to understand how people live with the disease and respond to treatments and drugs (which could also reveal unmet needs to improve treatment in the future). The digital tests were paired with hard copy diaries kept by the individuals, supplemented by two clinical visits for further tests. 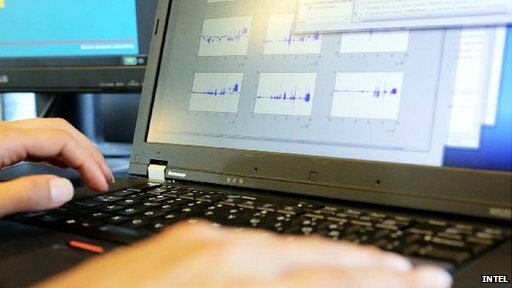 The scientists intend to create new algorithms following assessment of the data, to enable body movement symptoms and sleep patterns to be automatically measured and made available for review in real time. The next stage of the complex study will take place in Boston, New York and Israel and will involve releasing the app to enable patients to record how they are feeling and to report their medication intake, to inform future prescriptions and to understand gait, fluidity of movement, tremors, sleep habits etc. 24×7. Mindful of the sensitivity of patient data, Intel confirmed it would encrypt and anonymise the data to safeguard privacy. They also hope that it will eventually lead to opening up the sensor driven platform to other research centres and wearable devices in future. Other tech players involved in health tracking tech data and devices include Samsung’s Simband wristband, Apple’s Healthkit app and Google Fit software. Through their brand weight and increased market interest in digital healthcare including emerging names such as Theranos in blood testing and diagnosis, this is creating a momentum for the sector which is rapidly growing, as new possibilities and hope for sufferers of Parkinsons and other diseases open up in the future. Apple CEO Tim Cook has voiced dis-satisfaction with the low ratio of female employees at Apple in a recent employee diversity report. This disclosed a global 70:30 gender split in favour of a largely white male workforce. This is by no means startling for the technology industry, but nonetheless marks Cook’s goal to see the ratio change over time. Apple currently employs 35% females in non-tech roles, 20% in tech positions and 28% in leadership roles. For Cook though, the diversity message goes much deeper and wider: “Our definition of diversity goes far beyond the traditional categories of race, gender and ethnicity. It includes personal qualities that usually go unmeasured, like sexual orientation, veteran status, and disabilities. Who we are, where we come from, and what we’ve experienced influence the way we perceive issues and solve problems. We believe in celebrating that diversity and investing in it”. In comparison, the UK IT sector currently employs just 15% females in tech positions and 9% in leadership roles (source ONS, Aug 2014). This is surprisingly down on the top job stats for women from just ten months ago at the back of the UK recession, when females held 15% of leadership positions in technology. Given the future global growth for the technology and IT servicing sectors, it would great for the eoncomy for British female students exiting schools to get excited about jobs and career opportunities in the IT industry, as well as for employers to open their eyes to think about how they can attract this valuable talent pool that would change the skewed picture on both sides of the pond if we could take a leaf out of Cook’s book. Microsoft is no stranger to real-time 3D motion capture and has been facilitating developer’s innovative controller-free ideas for many years, using their Kinect for Windows sensor. The 3D sensor can let you navigate menus by moving your hands without actually touching any physical object. As clever as the device may be when utilised well, it is hard to argue the camera sensor is small. On the contrary, the existing Kinect devices are big and bulky, limiting its use to larger areas with the sensor fixed and calibrated to a central, ideal position. Microsoft’s Research labs are currently working on different technologies to miniaturise Kinect-like 3D depth sensing. One approach to accomplishing this task as demonstrated by Microsoft, involves turning a regular web camera into a depth camera. Using just low cost parts including a ring of LEDs, this transformation can take place in as little as 10 minutes, the down-side here being the greater accuracy and range from the bigger, more expensive units is lost. When the technology hits the right size we could find Kinect branded cameras on future tablets and smartphones. Using face detection to unlock your device and sign in and even letting you take advantage of in-air hand gestures to control the interface. The most interesting uses of the mobile Kinect technology could be seen via third-parties, if Microsoft opens up the Kinect APIs upon a possible release. This would make the innovative ideas from existing and future developers a lot more accessible when more people have access to the technology.